Want clients and want them NOW? Good news: I’m going to share all of the ways I know to get great clients. I’ve got half a dozen different methods you can use to attract clients. No one method is the silver bullet, but you’re going to have success if you try these. 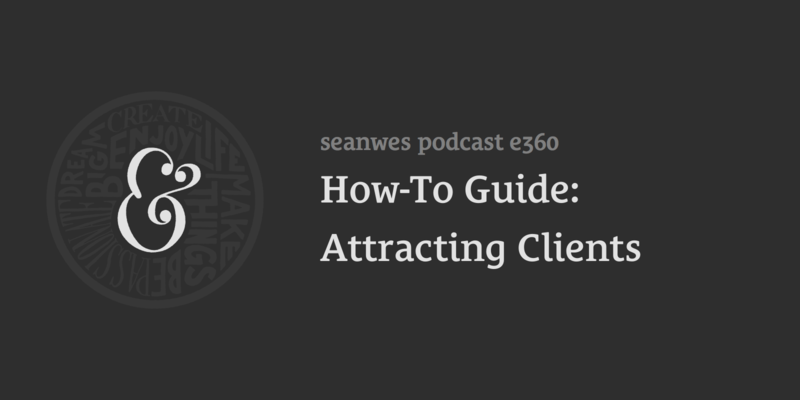 The goal is to get clients to knock on your door, but that doesn’t mean you have to be passive. We talk about some ways you can be PROACTIVE in getting new clients. When you cold call potential clients, you’re going against the Rule of Reciprocity: give first and then ask. Otherwise, you’ll start off on the wrong foot. Providing no-strings-attached value is what keeps you top of mind and builds trust with potential clients. Create compelling case studies—they show how you work, your focus on goals and outcomes, and help clients envision themselves in your projects (even if they’re personal or pro-bono projects). Teach what you know to the people who know less than you in your industry. Leverage your network; you know people who know people who would hire you. Put out content consistently around the thing you want to do. Go where the people you want to work with are. Who already values the work you do and where are they? Announcing that you’re available for work looks desperate. The right clients won’t want to work with you and the wrong clients will take advantage of your desperation. Make an email course instead of making an announcement—courses don’t just teach, they attract clients. You’re ready to make money when people are asking to give you money to do work for them. Your portfolio is not a place for all the work you’ve done, it’s a display of the type of work you want to do in the future. Clients don’t care about money, they care about results. The right client doesn’t want cheap, so don’t be cheap.